Register Today! Online registration will be open until Thursday, June 2nd. or turn it in on race morning. I have read and agree to the above waiver. Register Today! Online registration will be open until Thursday, May 15th. will be available for discount sale at the race. Ready to become a runner or walker? 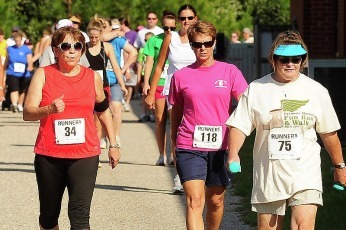 This is a great event for first time runners and walkers! Don't worry, even though it's called a race, it's really only a race against yourself. There will be walkers and runners of all speeds participating and just finishing will be something great to celebrate! If it's been a while since you exercised or you have any medical conditions, check with your doctor before starting a plan. Use a training plan (several are available here), but don't worry if you aren't able to stick to it exactly. As long as your body is getting used to gradually longer distances, you'll be getting stronger and more fit. Start out SLOW! This goes for your training and for the race. If you start out too fast, you're more likely to end up frustrated or injured. Listen to your body! Stretching is important, but don't try to stretch cold muscles! Walk or jog for a few minutes, then stretch and move on to your workout. A stretch cool down is good too. Prepare for your body to warm up. A good rule of thumb when running is to dress like it's 20 degrees warmer outside. So if it's 50 degrees, dress like it's 70 degrees. HOWEVER, you don't want to get too cold before or after your event, so layer a sweatshirt or pants over your work-out clothes. Drink plenty of water: before, during, and after walking or running. Sports drinks and snacks are not really necessary unless you are working out for more than 45 minutes. You don't want to eat back every calorie you burn! Don't try to break in new shoes on race day. Arrive at least 30 minutes early on race day! You'll need to park, check in, pin on your race number, and get to the finish line. You might want to also visit the bathroom and stretch a little. Don't stress yourself out by having to rush! Visit the Whiteville News Reporter to find 100+ more pictures of this event. All photos are by Mark Gilchrist. If you were in the top 3 overall or in your age group and would like your certificate, please send your name and mailing address through e-mail (columbusruns@gmail.com) or through the Contact Form on this site.